A new review by Tyrone Williams of volume one of Poems for the Millennium has just come out in the Bengali Kaurab magazine. Here are the opening paragraphs. You can read the rest online, here. Poems for the Millennium, Volume One: From Fin-de-Siècle to Negritude, edited by Jerome Rothenberg and Pierre Joris (University of California Press, 1995). The impossible task of the international anthologist, like that of the encyclopediast, depends, in part, on the objectivity of an idealized scientist and the aesthetic breadth, however subjective, of the cosmopolitan. How to render encyclopedic breadth, even within the delimited parameters of periodization and aesthetic-political movements, when “taste,” however worldly, must intervene? The traditional response of anthologists has been to acknowledge the inevitable limitations, shortcuts and outright omissions in the introduction. Jerome Rothenberg and Pierre Joris, as capable internationalists as we have in the United States of America, are eminently qualified to attempt the impossible. Both are renowned translators, anthologists and poets. They tackle the immense problems they faced assembling this anthology head-on, and though Poems of the Millennium: Volume One is indeed exceptional in its breadth and historical contextualizations, one of the very best of its kind, part of the pleasure of reading slowly and carefully through an anthology like this is not only rediscovering old pleasures (Apollinaire, Mallarme, Césaire, Damas, Trakl, Radnoti, etc.) while discovering new ones (Dario, Huidobro, Benn, Glatshteyn, etc. ), but also in weighing the consequences of choices forced upon, or decided by, the editors. And then there is the midground, the space where the poet stands, voice aliquantulum elata, “a little lifted up,” as it used to say in the Mass, talking to you, but only only to tell you where he’s been and what he’s seen. And this is where Joris’s work is most distinctive. If Creeley talks to you in bed, Joris talks to you at the teahouse, in the café. This is the great possibility he identifies, it seems to me, when he speaks of the Nomad and the nomadic as exemplars of a poetics. The nomad carries his world with him, and travels through ours. And of course that’s what Olson, especially the Herodotus Olson of the early Maximus and The Distances, was after– someone speaking from where he has been, and from whom he has been while there. There is something felicitous in Pierre Joris’ writing. At the speed of soliloquy, but before others, for others, he rediscovers what was once called the stance of improvisation–of inspired improvisation. Inspired? Inspiration has been given a bad name. So let us speak of respiration, transpiration, of spiration: the interrupted whole, the apparatus of interruption, to the degree to which it is constitutive of thought. Thought thinks (with caesuras, enjambments; it runs out of breath, accelerates, slows down; it moves with precipitation, restraint, suspense, glissandos, drops, ostinatos, stoppings) with rhythm. It is axiomatic that rhythm is not exterior to thought. Rhythm doesn’t simply prop thought up, it configures thought. 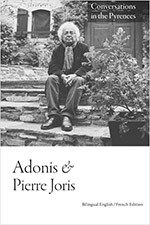 In Paris in 1966, I wrote that P. Joris was “brilliant” and a “great poet.” I have spent the intervening years being wrong about far too many things. It is comforting to know that I was right on both counts.